Founder Sally Lehrman discusses how research is helping mold the organization’s future efforts. Journalists: It’s time to show your work. Improving transparency is a clear way to build trust in journalism — and it may have financial benefits, according to research from the Trust Project. 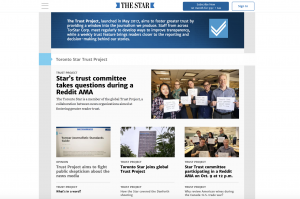 You’ve likely heard of the Trust Project, or seen its Trust Mark logo on your go-to news site. Where did it get its start? 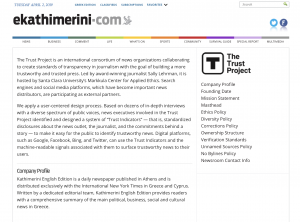 More than 70 news outlets initially came together as the Trust Project to develop transparency standards — known as Trust Indicators — to help the public make better, more informed news choices. The research-backed Trust Indicators include standards in methodology, community engagement, diversity, local sourcing and more, and debuted in November 2017. 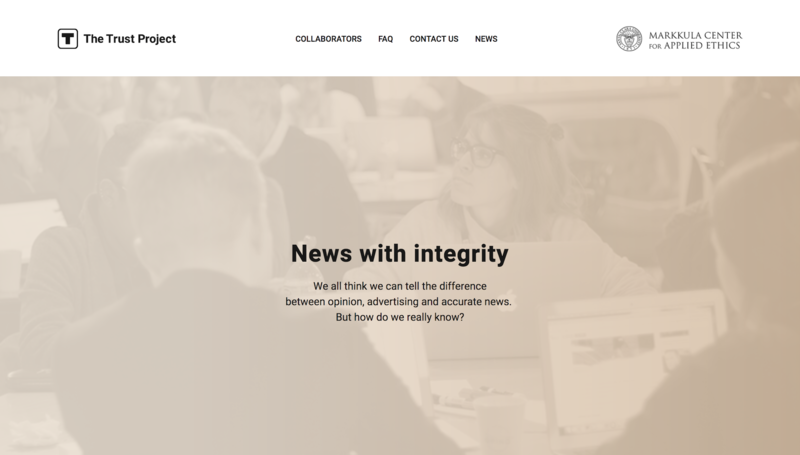 The international consortium, essentially in its version 2.0, now includes about 200 newsrooms and receives funding from Craig Newmark Philanthropies, Google, the Democracy Fund and others. We chatted with Founder Sally Lehrman about what she’s learned so far, and what to expect for the Trust Project’s future in research, development and partnerships. Editor’s note: This transcript has been edited for clarity. Question: An important feature of the Trust Project is how it grew from research. As a longtime journalist yourself, were you surprised by anything news consumers told you at the outset of the Project? Sally Lehrman: At the time we were doing the research, there was a lot of concern about if the public really cares about news. Of all the different types of people we talked to, we identified four different user groups, ranging from the avid, super interested to the angry and disengaged. All of them care about the news. So even the angry and disengaged felt like it was important to have quality, trustworthy information. I think sometimes as journalists we forget that, and sometimes we’ll write the public off. We don’t think they understand or have the same feelings about the importance of what we’re doing. In fact, they do see journalism as very important. It’s about how they see our “agendas,” as user groups put it. Even the avid, interested users felt like news organizations had an agenda. So their response is to go out and crosscheck the news. The angry, disengaged user feels the news has an agenda. What they’ve done, in many cases, is just stop using it — or they’ve become angry and start looking for information in places we really wish they wouldn’t go because of the misinformation involved. Q: Your research with UT-Austin showed Trust Indicators improved perceptions of trustworthiness, credibility and reliability. And that one of your major newsrooms, Trinity Mirror, captured its own metrics. What are your major takeaways from those two measuring efforts? SL: It was exciting to us! After our experiment, Talia Stroud [from UT-Austin] told me it could go either way — we could find out the Trust Indicators don’t work at all. But it turns out they do have an effect. It was a statistically significant difference between those who saw the Trust Indicators and those who didn’t. The most exciting result about behavioral intentions was that people said if these Trust Indicators were in place, they would be more willing to pay for news from that site. Thirty-three percent said they were somewhat to much more willing to pay. We want to explore that more and find out if we can assess how real that is and quantify it better. And then Reach plc’s [study on Trinity Mirror] was a pre-/post-study, so before and after they put the Trust Indicators on their pages. It was a live experience. They got an 8-percent increase in trust overall, and that was on top of the existing trust they had. They also had a 9-percent increase in whether the journalists are trustworthy — basically, had they done their homework. And another one that was another big jump was, are journalists honest about their sources. We hope to do more research with newsrooms to understand better what people respond to and how to improve their relationship with legitimate news outlets. Editor’s note: Read more about the Trust Project’s research with UT-Austin and Reach plc here. Q: Do you have any plans to do more surveys or research? What do you hope to learn? SL: We plan to work further with newsrooms to deepen that research and understand how we can use Trust Indicators to improve the relationship between news organizations and the public. Mainly it would be to investigate that monetization idea and also understand better how the Trust Indicators work to build trust. For some of the newsrooms, it might be replicating the Reach study so we can see how else it’s holding up. Others may want to do a deeper dive on one or more of the Trust Indicators. We’re talking to UT-Austin about doing further research, but we haven’t decided yet what that research will be. Q: What kind of feedback are you getting from the news organizations? SL: It’s a variety of things. Internally, they talk about the Trust Project providing an opportunity for them to review things they hadn’t looked at in a while — like their ethics policy —and make it more transparent to the public. They also like the opportunity to work with other newsrooms and share information about how they’re implementing the Trust Indicators. In terms of audience response, it’s a mix. I think overall trust is increasing. They also get a mix of people saying, “I’m so happy you’re doing this,” to new complaints like “You have this ethics policy, but I don’t think you’re implementing it.” And that’s a good thing, that’s what we want. We want people to feel like they can challenge us as journalists, and for us to have the opportunity to respond. I really don’t want people to just get to some point, walk away and feel like, “Oh this news organization is just not responsive, or doesn’t do a good job reporting.” Sometimes the complaints will come to me, and I’ll forward it to the site. In Europe, somebody wrote in and they said, “We’re angry about how this news organization is covering the political situation. We feel like they are not paying attention to this sector of society.” What I did was just say, “Part of the Trust Project agreement is that the newsroom will be responsive to the public. That’s one of the Trust Indicators. So let me forward you to the person there at the newsroom.” The website was great. They got right back to them and said, “Here’s why you see this kind of coverage and we welcome your suggestions.” To me that’s the ideal outcome. Q: Many of your highest profile initial newsrooms were quite large. How would you explain the importance of transparency to a small newsroom who might not have the time, money, resources to implement them at once? SL: So first of all, they don’t have to implement them all at once. We have some ways to make it easier for them, and we work very closely with them. One of the things that I tell smaller newsrooms is that you become part of this cohort of newsrooms working together to implement the Trust Indicators. It’s easier for them and they can learn a lot from the experience because we’re not just saying, “Oh go do this and come back.” We’ll do the level of support that they need — short of that we don’t actually do development for them. We do have a WordPress plugin that many of them can use now. That will make it easier for the smaller ones, and that’s why you did see smaller newsrooms in this most recent cohort. As a small newsroom, they probably have strong trust already. But they are part of this whole news ecosystem right now where trust is eroding. So why not take this opportunity right now to be part of this broader movement to be more transparent about the things that you’re already doing as a newsroom? There’s still so much misunderstanding about how journalism works. Q: You’ve partnered with tech platforms to make sure the trust indicators are machine readable and could be used to elevate credible news in search and news feeds. Is that an important part of the project? SL: That’s a good question. We have active external partnerships and commitments with Google, Facebook and Bing. Twitter has also agreed to use the Trust Indicators. To get a better understanding on the active partnerships, we just continue to deepen how they’re going to use them. It’s a mixture of conversations about algorithms and display. Google is right now using the Trust Indicators in their assessments of authority — which is very important in terms of search results. They are also using them when they display labels: analysis, opinion and I believe in-depth. Our markup helps them do a better job displaying that. We also have a “local” Trust Indicator. I hope that we’ll be able to work with the platforms and newsrooms to enhance the platforms’ ability to display local news when it is most relevant. Q: What’s coming up in 2019 for The Trust Project? SL: Our biggest emphasis this year is scale. We feel like we’ve put all the pieces in place to have a strong set of Trust Indicators that resonates with the public and newsrooms. So now, let’s scale, let’s grow. That’s our primary emphasis, and part of that growth is looking for opportunities to make sure newsrooms have what they need to decide to come along with us. That means continuing to work with platforms and enhancing both the benefits that platforms and newsrooms get. It also means enhancing our research so we can better understand what the Trust Indicators can contribute. And then, finally, just enabling other organizations like the News Co/Lab to work with us and build on our work.